The Indian Museum is the largest and oldest museum in India with rare collections of antiques, armour, fossils, mummies and Mughal paintings. 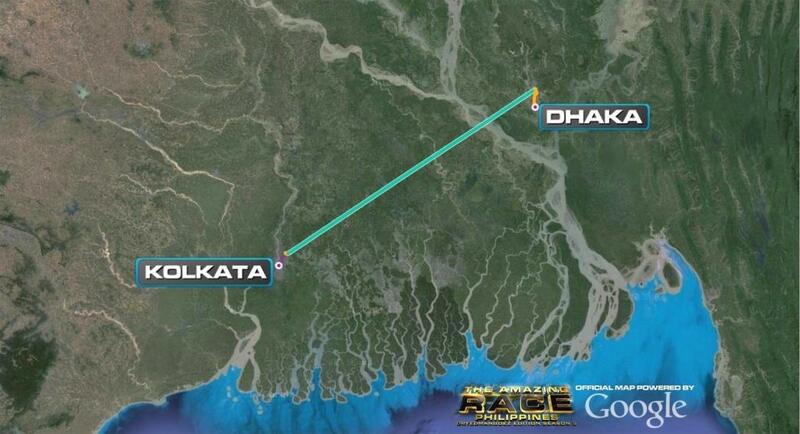 It is here where teams will begin the 7th Leg of The amazing Race Philippines. 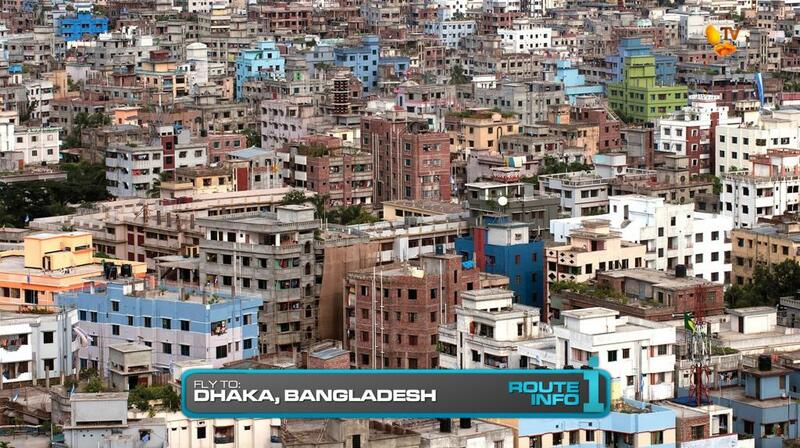 Teams must now fly Jet Airways out of Kolkata directly to Dhaka, Bangladesh. 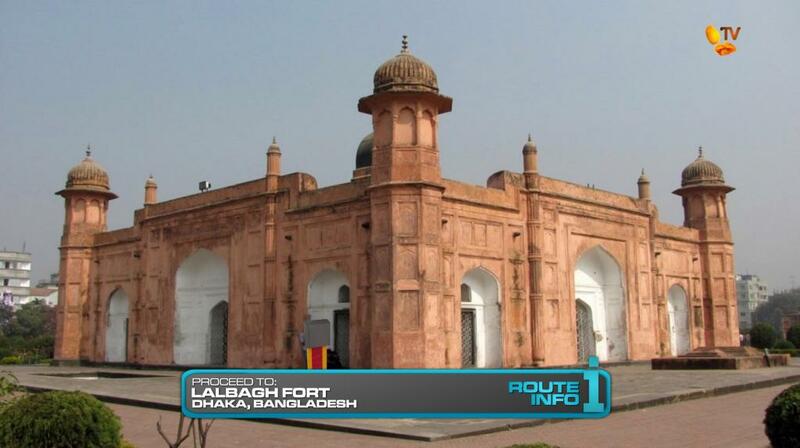 Arriving at 9:15am, teams must first make their way to Lalbagh Fort where they must search the grounds for their next clue. And that first clue reveals the Detour for this Leg: Straw Dogs or Bamboo Jungle. 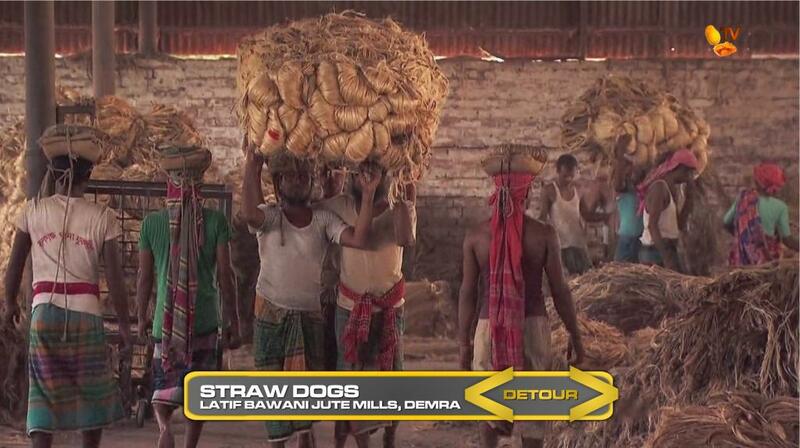 They must then deliver those 20 bundles of completed straw to the looms. At the end of the production line, teams will receive a jute mat with a painting on it which they must keep until further notice. In Bamboo Jungle, teams must travel to Tarabo Bazaar where they will collect 40 pieces in three sets of bamboo trunks, each with different lengths and diameters, from a storage area. 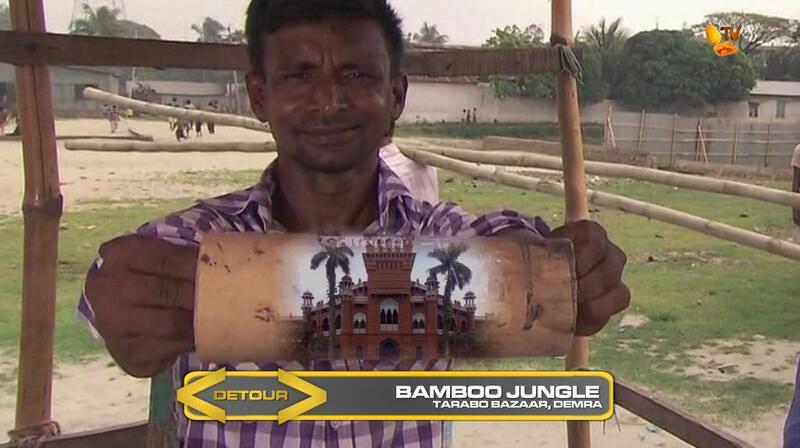 They must then use a freight rickshaw to deliver the bamboo to a nearby construction site. Once their delivery is confirmed by the foreman, they will receive a small length of bamboo with a painting on it which they must keep until further notice. 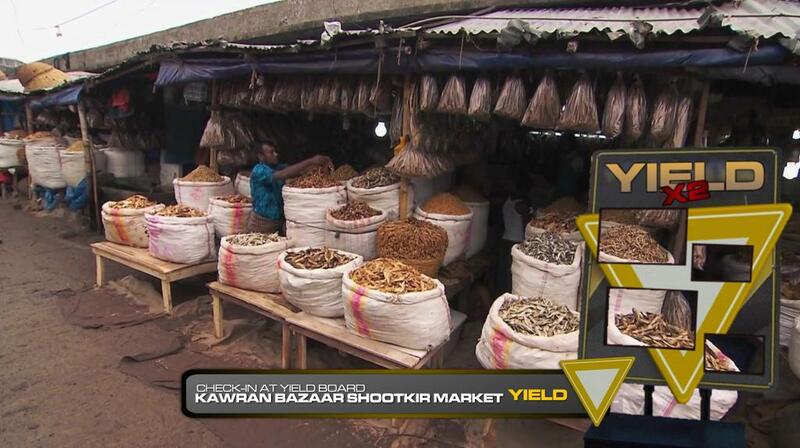 Teams must now make their way to the Kawran Bazaar Shootkir Market to search for the Double Yield board! 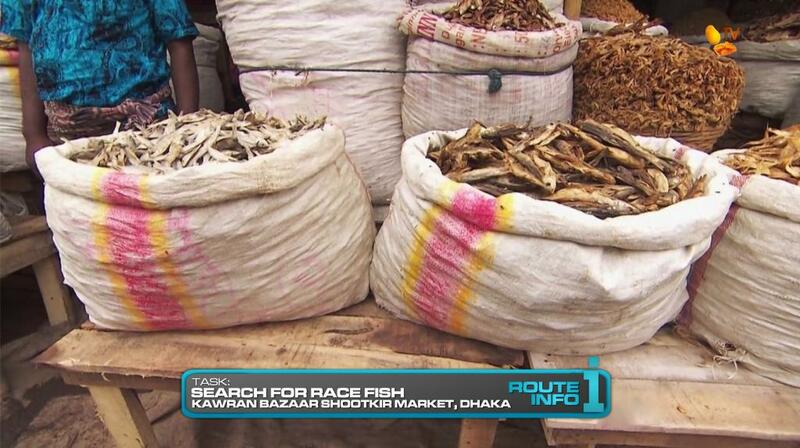 After checking into the Double Yield board, teams must look for a marked stall and search a basket of dried fish to find one colored yellow and red which they can exchange for their next clue. 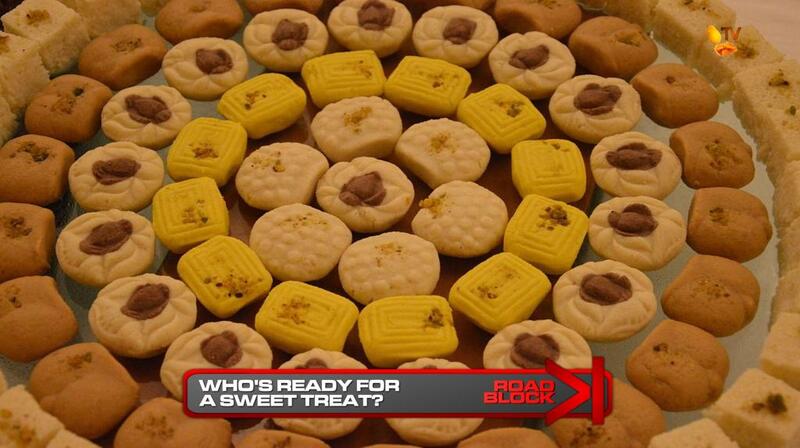 That clue reveals the Road Block: Who’s ready for a sweet treat? In this Road Block, teams must head to this confectionary shop where they will eat through a tray of different varieties of the Bengali dessert known as Sandesh looking for one with a red syrup-filled center. Teams must eat every sandesh they bite into. Once they’ve found the correct sandesh, they will receive their next clue. That clue tells teams to head to the Pit Stop. But to find the Pit Stop location, teams must refer to a clue given to them earlier in this Leg. 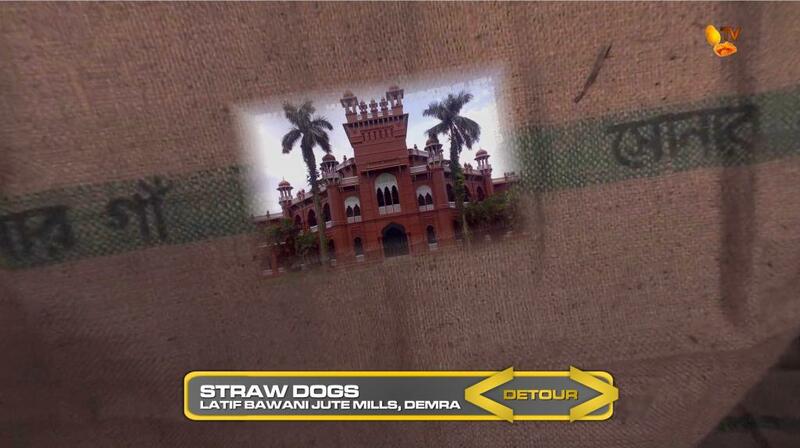 Teams should figure out that they must refer to the jute mat or bamboo they received at the end of the Detour which has a painting of Curzon Hall at the University of Dhaka, the Pit Stop for this Leg of the Race. The last team team to arrive WILL be eliminated. This Leg definitely starts out very physical. The TAR21 Detour was pretty good and definitely physical, which in turn provided great fun. Especially with the bamboo. But in TAR21, I believe, the Detour was at the end of the Leg? So the clue directed them to the Pit Stop location. I did the same here, but moved things around so teams would get the Pit Stop drawing earlier. Teams would have to take care of it until they needed it. So either teams could lose the clue (you hope! Good TV!) or when they get the last clue, teams won’t know to check the bamboo or jute mat. So it could provide another tense finish. Or not. It definitely depends lol. The Route Marker with the dried fish won’t be as gross here as it was to the American teams since Filipinos are of course used to the smell. But I am kinda iffy on having this one search task right before another searching/luck task in the Road Block. I chose this for the Road Block because so far this Race, teams haven’t had a luck task and they haven’t eaten at a task either. Putting the Race together, I thought of all the different kinds of tasks you’d want to see on a Race and I tried to at least have one of each (luck, puzzle, searching, eating, physical, water, etc.) the entire season. And at the end, again, you’d hope the tricky clue will provide for some tense moments in the Race to the Mat. This will probably be the toughest elimination of the entire season, depending on how things work out. There’s plenty opportunity for teams to mess up and screw themselves over. But the Detour definitely also has the potential to skew towards all-male or male-female teams. TARPH2’s teams would’ve probably quit those Detours. 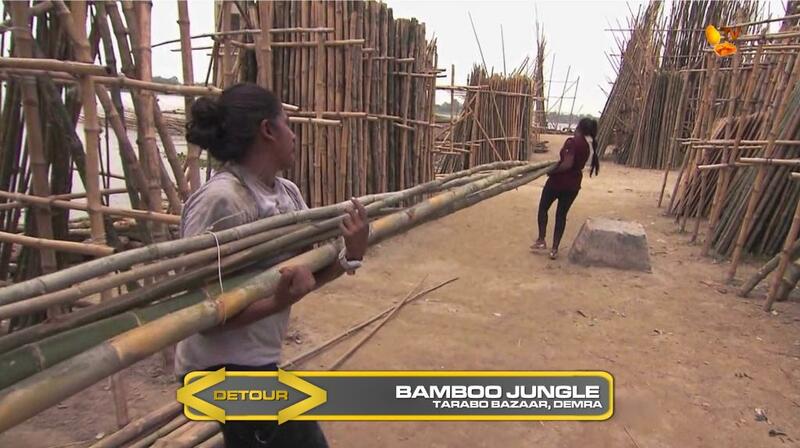 But we should also remember in TAR21, Natalie & Nadiya finished 2nd doing the Bamboo Detour. And the other women of the Race didn’t have much of a problem taking care of it either.